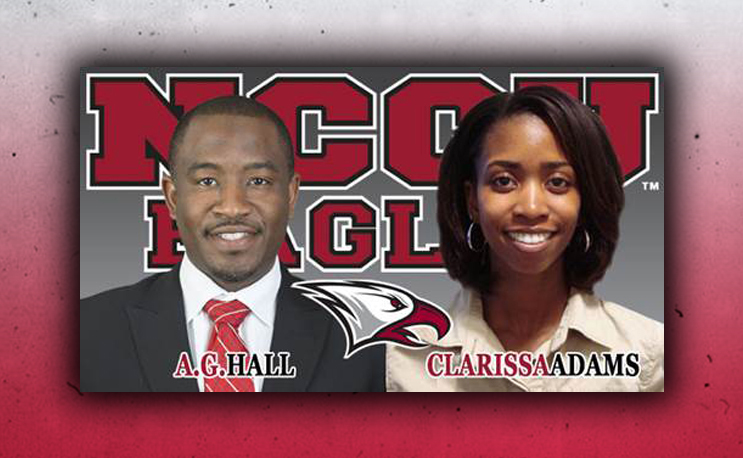 DURHAM, N.C. – North Carolina Central University Head Women’s Basketball Coach Trisha Stafford-Odom has added two more members of her staff for the 2017-18 season with the addition of Assistant Coach A.G. Hall and Director of Basketball Operations Clarissa Adams. Hall, who was an assistant for the Lady Eagles when they advanced to the NCAA Division II Tournament on back-to-back seasons at the start of the millennium, returns to the NCCU coaching staff after having gained head coaching experience. Hall has a total of 16 years of collegiate women’s basketball coaching experience, which features 10 years as an assistant at the Division I level between Providence College (2002-08), Clemson University (2008-10) and Bethune-Cookman University (2010-12). After graduating NCCU with a Bachelor of Business Administration (B.B.A.) with a major in accounting in 1998, Hall started his coaching career at his alma mater for two seasons from 2000-02. The Lady Eagles went 49-13 over that span, winning consecutive Central Intercollegiate Athletic Association (CIAA) Western Division titles before advancing to the NCAA Tournament both seasons. The 2001-02 team in Hall’s second season won its first two tourney games before being eliminated in the round of 16. Hall played 58 games for the Eagles and was a teammate with current NCCU head men’s basketball coach LeVelle Moton. Adams will serve as the director of basketball operations at NCCU after spending the past decade with the women’s basketball program at the University of North Carolina. While in Chapel Hill, Adams served as the director of student-athlete development/recruiting assistant under the leadership of Naismith Memorial Basketball Hall of Fame inducted coaching legend Sylvia Hatchell since 2007. Her tenure at UNC included two seasons with Stafford-Odom, who was an assistant coach for the Tar Heels from 2011-2013. Adams, who worked with the UNC football and men’s basketball teams as an undergraduate, earned a Bachelor of Arts degree in exercise and sports science from UNC in 2005. She started her career in collegiate athletics by working in both the UNC football operations and recruiting departments before moving over to women’s basketball program two years later. Adams is a National Academy of Sports Medicine (NASM) certified personal trainer.